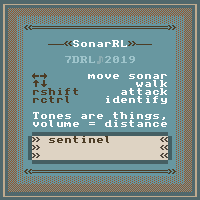 A 7DRL where you explore a dungeon through audio only. Every tile type has a unique sound, and you can "see" the environment by rotating a straight sonar beam that plays the sound of the tile it hits. The louder the sound, the closer the tile. Right now, gameplay is a matter of walking through the dungeon and trying to find the exit. This is an INCOMPLETE 7drl, in the sense that it is not the final product I would have liked it to be. However, since I believe it has merit (not really as a roguelike, more like an exploration game) in its current state, I do not think it is an unplayable failure. Just navigating through the dungeon is a challenge, and quite fun by itself. Enemies with AI: Pathfinding, attacking, etc. One of the biggest challenges for me in developing this audio-only game was the fact that my computer has issues with its audio system. The audio drivers break just about every day, forcing me to stop in the middle of programming and then spend however much time is needed to get them working again. I lost three days of programming in the middle of the week because the audio simply would not work during that time. If I had been able to use those days, I believe I would have been able to complete the game. 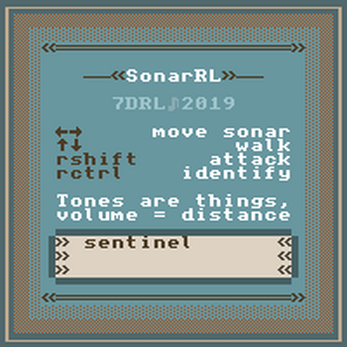 Extract "sonarRL" from the zip and run the .exe inside it to play. This won't run for me -- reports a missing DLL, libgcc something something. Thanks for letting me know! I uploaded a new version, it should run now. If it doesn't, tell me- I can't reproduce the error on my own computer so I couldn't test it.